The Netgear WN802T is a wireless N access point designed to provide small office, home office enhanced coverage and wireless connectivity. It supports wireless multimedia with power saving mode that helps save power up to 40%. Equipped with host of security features, it is a great device to have in the office. Wireless Connectivity: The WN802T supports the latest 802.11n draft version along with the standard b/g standards. Thus this device allows for gradual network upgrade without having any visible impact on existing network. The individual wireless devices can be upgraded as and when desired – the backward compatibility of the router allows for the seamless overhaul of the office network. Besides the wireless connectivity, the device also has a single Ethernet port that can scale up to gigabit rates providing enhanced wired connections to complement the high wireless bandwidth. Typically this Ethernet port would be used to connect the access point to the broadband network through a firewall. Service Quality: WN802T comes with important features like Wireless Multimedia (WMM) support with power saving aspect that help deliver improved wireless network performance. The WMM technology ensures that delay sensitive traffic streams like voice and video are given higher priority in the traffic flow thereby ensuring good end user experience. WMM is very important while supporting VoIP calls from wireless devices. The access point also comes with the WMM-PS mode which is a power saving mode designed to save power at both the access point as well as the wireless device end by as much as 40%. This helps extend the battery life of the wireless devices. Wireless Security: Like most enterprise grade access points, the WN802T also comes with a set of standard wireless security features. The most basic feature is the wireless encryption and in this regard WN802T supports Wired Equivalent Privacy (WEP) of 64 bit, 128 bit and more secure 152 bit encryption. It also supports Wi-Fi Protected Access (WPA-PSK and WPA2-PSK) encryptions too. WPA is a more secure solution although it is not available in all wireless devices, hence while setting up the network, the administrator needs to take into consideration the compatibility with the existing devices in the network. It also supports MAC address authentication to ensure unauthorized devices are not allowed to connect to the network. With wireless access control the device can determine the level of access each connected device can have over the wireless network. Lastly, WN802T is compatible with RADIUS AAA server to support enterprise level authentication. This is of significance in enterprises where various users have varied levels of access to critical network resources. 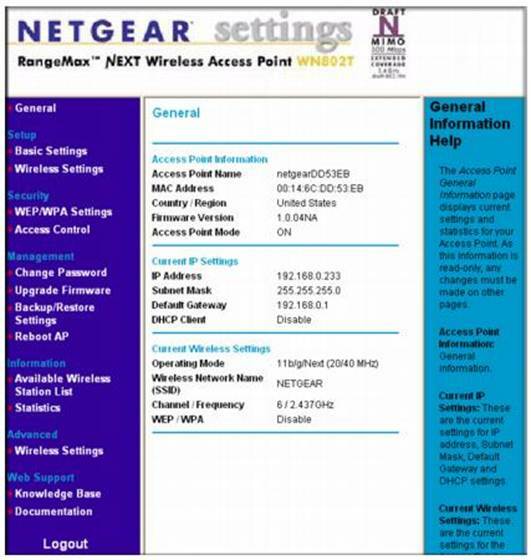 The wireless access point from Netgear can be purchased from a host of retailers and distributors. Netgear, being a very popular brand, has a solid distribution network which allows its customers to purchase its products from several places. Some of the most popular online retailers include Amazon.com, BestBuy, Dell, TigetDirect.com, NewEgg.com, Wal-Mart, Zones and several others. 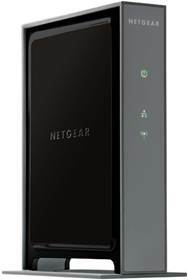 The device can also be purchased from the Netgear Store itself. Just visit http://store.netgear.com/ and look up the model number. It typically costs around $120. However, with regular sales, one could get it a bargain price too. What are Contents of the Box? The WN802T access point is designed primarily for extending the reach of wireless networks or to provide wireless connectivity in the enterprise network. It comes pre provisioned with an IP address of 192.168.0.233; so while configuring it the computer connected to it must be in the same subnet. It is best to add a temporary static IP address to the computer of something like 192.168.0.210 with subnet mask of 255.255.255.0. This way the setup screen of the access point can be accessed by directly connecting to its Ethernet port. While logging into the access point setup the login credentials to be used are user name as admin and password as password. 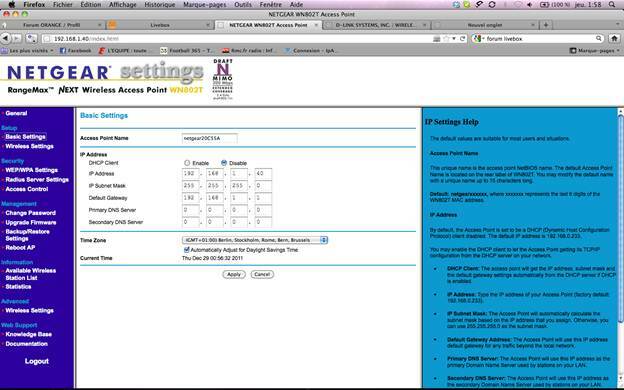 Once logged in the configuration setup shows various options to configure different aspects of the access point and the wireless network. Click on Basic menu to view the basic wireless setting.